ROYAUME UNI – Cedars Park - The most recent archaeological investigation at Cedars Park, the site of historic Theobalds Palace, home to King James I, took place on Saturday 20 October. One of the opened trenches fully recorded the late eighteenth/early nineteenth century culvert within the ornamental canal. The other found the nineteenth century footpath in the walled garden, and established that features appearing on an 1883 map probably represented a group of trees (possibly with other features) forming a focal point at the end of the path. The only find of note was part of a rare 1948 metal toy figure of a cricketer. ROYAUME UNI – Leicester - Archaeologists are looking into the possibility that the second set of human remains found at the Richard III dig site are those of the friary's founder. 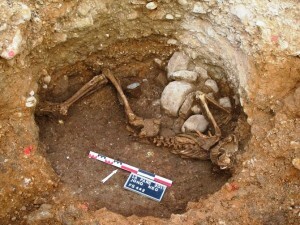 A female skeleton was unearthed at the Franciscan friary in the city centre at the same time as University of Leicester scientists were excavating the body of a man they believe could be Richard III. The female remains have not been subjected to the same rigorous examination as those of the last Plantagenet king. However, evidence suggests they may be the remains of Ellen Luenor who, along with husband Gilbert, is thought to have founded the 13th century friary now buried beneath the Greyfriars car park, in New Street. Dig site manager Mathew Morris said: "The remains were found in the east end of the church and there's a possibility they belong to Ellen Luenor, who could be either a benefactor or the founder of the friary where Richard may be buried. "We haven't had the chance to get into any detailed analysis of the remains, but it is something that we would like to do in the near future." INDE – Nagardhan fort - The wall of the historic Nagardhan fort near Ramtek caved in on October 7 due to negligence and substandard work material, archaeology experts have alleged. The fort is believed to have been built between 300 and 40BC by the Gond kings. But during the reign of Bhonsalas, it was renovated on a regular basis, till about 300 years ago. The Wakatak-era fort has become a picture of utter neglect even as it was being protected under the Maharashtra Ancient Monuments and Archaeological Sites and Remains Act, 1960. Situated in the old town, the Wakatak-era fort was established by Suryavanshi king. Earlier, it was known as Nandivardhan and was believed to be the ancient capital of Vidarbha region. The square-shaped palace has eight towers for installing canons all over. An ancient underground well still lies inside the fort and houses an old temple of goddess Tulja Bhawani. The fort is illuminated and decorated only during nine-day Navaratri festival as lakhs of devotees visit the place to have darshan of the goddess. FRANCE – Sainte Verge et Louzy - La construction de la déviation routière de Brion-près-Thouet (RD 938) par le Conseil général des Deux-Sèvres a permis d’étudier, sur 3,3 hectares, un site archéologique rural sur les communes de Sainte-Verge et de Louzy, au nord de la ville de Thouars. La fouille préventive a révélé des occupations s’échelonnant de la période néolithique aux périodes antique et médiévale. La partie antique et médiévale est la plus documentée, avec notamment un grand ensemble antique réoccupé durant la période médiévale. Ce cas exceptionnel est une occasion unique d’étudier l’évolution des bâtiments, leur conservation, leur destruction partielle (volontaire ou non) et les modes de réappropriation des espaces dont les vocations et fonctions sont modifiées. USA – Boise - A porcelain-toothed dollhead so creepy archaeologists took to calling it "Chuckie" after the murderous movie doll. Intact bottles whose stamped glass tells tiny tales: "Sarsparilla, Lowell, Massachusetts." A shoe made of scab-brown leather as delicate as papyrus. A porcelain lid from a jar of "Oriental Tooth Paste," advertised as "England's Favorite Dentifrice," guaranteed to "impart a delicate fragrance to the breath." Those are some of the 7,000 to 10,000 bits and pieces of Boise history turned up during a two-week excavation in August of an old well on Boise's Basque block. University of Idaho archaeologists also found marbles, tobacco tins and shards of flowered china in the well next to the Cyrus Jacobs/Uberuaga House on Grove Street. Many of the artifacts date to the era of the house's original owners, the Jacobs family, who built the home in 1864. It did not become a Basque boarding house until the following century. Cyrus Jacobs was an entrepreneur and merchant who owned a number of businesses. The preponderance of toys and remnants of imported products found — French shaving cream along with the English toothpaste — reveal a family with expendable income. TURQUIE – Gallipoli - An "extremely successful" survey of the Gallipoli battlefield has turned up bullets, boot fragments and Roman remains. Archaeologists and historians from New Zealand, Turkey and Australia have just completed a third field session at the battlefield. "We made an intensive survey of three important areas - the positions at Pope's Hill, Russell's Top/The Nek and near the Lone Pine Memorial," New Zealand participant Ian McGibbon said. "It was an extremely successful session," he said. The latest survey found several important underground features, including the site of a Roman camp. The survey traced more than 3600 metres of trenches, recording more than 80 tunnel slumps or entrances and dugouts. In total it found 480 items, including shrapnel shells and fragments, bullets, boot fragments and a Turkish bayonet. TURQUIE – Ani - Archaeologists are planning renewed excavations next year in Ani, an ancient Armenian city in the eastern province of Kars. The work will involve creating a detailed map of the site, which was once the center of a powerful Armenian empire and possessed a population of between 100,000 and 200,000 over a millennium ago, making it one of the biggest cities in the world at the time. Ani was once the capital of a medieval Armenian kingdom that covered much of present-day Armenia and eastern Turkey. Ani is protected on its eastern side by a ravine formed by the Akhurian River and on its western side by the Bostanlar or Tzaghkotzadzor valley. The Akhurian is a branch of the Aras River and forms part of the current border between Turkey and Armenia. Dubbed the “City of 1001 Churches,” Ani stood on various trade routes, and its many religious buildings, palaces, and fortifications were among the most technically and artistically advanced structures in the world at the time, according to specialists. Unearthing the ruins at Ani would shed light on the past, Doğanay said. Doğanay said the site occupied 78 hectares of land and was surrounded by 4,500-meter-long ramparts. In addition to its numerous churches, the site also features the remains of an inn, a public bath, a mosque and other buildings, Doğanay said. The site was located on the historic Silk Road and formed the first gate connecting the Caucasus to Anatolia before a sea route was discovered. “[The city] declined in importance after [sea routes gained prominence]. And it was destroyed by periodic earthquakes. Between 1965 and 1966, a professor named Kemal Balkan launched the first excavation work on the Ani ruins.